There is indeed a distinct echo in Shostakovich’s first piano sonata from the opening of Prokofiev’s third piano sonata, composed in 1917 but itself based on an earlier work Prokofiev composed aged 16. There are hints, too, of Prokofiev’s penultimate Vision fugitive, itself inspired by the street fighting during the February 1917 Revolution. 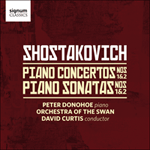 It is altogether one of Shostakovich’s most ferocious works, and amply demonstrates the young pianist-composer’s ambition. Indeed, Shostakovich was already seen as one of the brightest hopes of Soviet music: in just the previous year he had been unanimously accepted on the Leningrad Conservatory’s post-graduate composition course, aged 19, having already composed his first symphony—the work which in May 1927 was to receive its first Berlin performance conducted by Bruno Walter and then subsequently taken up by Toscanini and Klemperer. His promise as a pianist was virtually on the same level: only a month before his first encounter with Prokofiev, Shostakovich had participated in the first Chopin Piano Competition in January 1927, in which he reached the finals; and his repertoire encompassed such virtuosic works as Liszt’s Venezia e Napoli and Beethoven’s 'Hammerklavier'. In his compositions Shostakovich, after mastering the orthodox nationalist style of Borodin and Rimsky-Korsakov in his earliest orchestral works, had quickly shown a rebellious streak. To the dismay of both his composition teacher Maximilian Steinberg (Rimsky-Korsakov’s son-in-law) and his piano teacher Leonid Nikolayev, Shostakovich increasingly turned for inspiration to such leading modernists as Stravinsky and Prokofiev. Nikolayev was distinctly unimpressed with Shostakovich’s Op 12, calling it 'a sonata for metronome to the accompaniment of piano'. It is, of course, far more than that, but it is unquestionably a gnarly and knotty work for both performer and listener. It starts with a by turns nervy and thunderous allegro, eventually arriving at a rumbling tremulando in the bass punctuated with pugnacious note clusters. Then follows a lento in which an alto melody is picked out, sandwiched amid what Prokofiev described as 'supple harmonies' (here one may suspect the lingering influence of Scriabin, notwithstanding the fact his work was much reviled by Shostakovich in public). This leads without a break into a concluding allegro, boiling upwards from the bass like a malevolent spirit (and surely recalled by Prokofiev in turn in his eighth piano sonata composed during World War II).